Inspiration is one of the first ingredients that a designer draws from to create a design. Most of the time inspiration can come from a favorite color, environment, or even a favorite memory. Look all around you, there are so many different colors and textures everywhere you look. Let the things that you love inspire you. . . .
5.Use nature- Grass, trees, animals, insects. . .
See how easy it is to design! The video shows you how easy it is to create a masterpiece. 1. 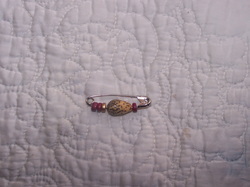 Find a safety pin any size will do. HINT: You can use items from old clothing and jewelry such as buttons,embellishments, rhinestones etc. * Remember ask a adult first.